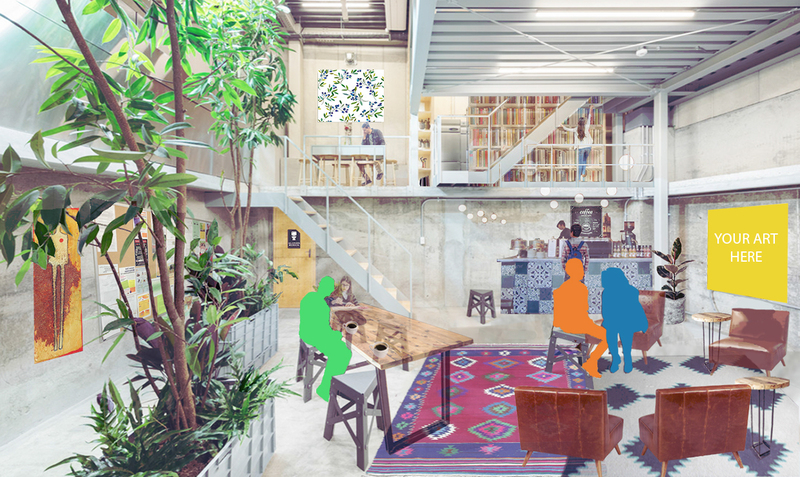 A University of Washington student designed this rendering of the future Doorway Project cafe, based on feedback from homeless young adults and other community members. It started with a Sunday afternoon café outside a community center last December — the University of Washington’s new initiative to reach homeless youth around the U District. In the eight months since, the UW’s effort, known as The Doorway Project, has offered a café in the neighborhood each quarter, while students have helped add services — from preventive health care to establishing a fundraising organization to designing a permanent café home. Now, as The Doorway Project prepares for its summer café on Friday, faculty, students and partner organizations are planning a second, expanded school year of serving the neighborhood, which has one of the largest concentrations of homeless young adults in the area. The 2018 Count Us In point-in-time count — a one-night tally in January — found 1,518 homeless youth and young adults under age 25 in King County. The Doorway Project’s summer café will run from noon to 4 p.m. Aug. 24 at Street Bean Café, 5015 Roosevelt Way N.E. The Doorway Project emerged as part of Urban@UW’s Homelessness Research Initiative. The UW received $1 million from the state over two years, to be shared between the university and its community partner in the endeavor, YouthCare. The longtime Seattle organization coordinates social service resources for homeless youth, while at the UW, the schools of nursing and social work are leading the community-based participatory data collection that informs design and planning for the permanent, indoor home for the café and its related services. With Doorway funds, the UW Carlson Leadership & Public Service Center provides 10 paid student internships with community partners serving homeless youth. These student interns provided 1,900 hours of community service for the first year of the Doorway Project. The University of Washington’s Doorway Project has been offering pop-up cafes for homeless youth in the U District since last December. Attendance at the café events was one success, Ensign said. Some 400 people participated in the pop-up cafes, which aim to take a navigation center approach: In addition to meals, the events offer basic medical care and resources for transportation, education, legal help, housing and other social and support services. Student involvement helped expand the reach, she added. 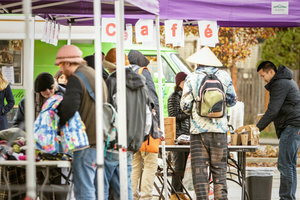 A number of groups, both formal and informal, have provided services, such as the Health Sciences students who offer care through University District Street Medicine, and the Doorway Project registered student organization, which since January has organized volunteers and recently set up a GoFundMe page to help support the café’s “pay-it-forward” model. Not everyone carries cash to put toward meals on site, Doorway Project research assistant Noah Weatherton explained, so the online fundraising link gives people a chance to donate outside of the event. UW students see homelessness “all around them every day,” said Weatherton, a graduate student in nursing who specializes in mental health. “It’s been an opportunity for them to plug into the larger University District community and begin to make a difference both on and off campus,” he said. Moving operations indoors is a priority for Doorway’s second year, Ensign said, as is, ultimately, landing a permanent spot for the café in the University District. The quarterly cafes have rotated around the neighborhood so far. An initial schematic for the café will be on hand this Friday, with interactive community feedback. The sketch incorporates ideas from homeless youth, service providers and community members: a street-level coffee house, with a small lending library, art room, and connections to adjacent rooms for a wellness center, education, counseling services and a studio space for ongoing community-campus collaborative projects. “Our aim with the Doorway Project is to create a community café, a safe space and resource hub for all young people in the U District experiencing housing and food insecurity — to have it be a welcoming place for coffee and positive community connections so everyone has a chance to thrive,” Ensign said.